I live in the northwestern Great Plains in Montana..think wide open spaces, big skies and broad expanses of land for farming and ranching. Not a lot of trees, so my friends all like to make fun of me because lots of trees kind of freak me out and mountains make me feel closed in and sort of trapped. I know people like to "escape to the mountains" for the "open spaces", but it just doesn't feel open to me. ANYWAY. I ran a 30k Trail Rail Run in the mountains and the funniest thing to me about that was that I don't think the elevation ever went higher than where I live at nearly 4,000 ft. It was in beautiful St Regis, Montana and it is beautiful. It is also just full of trees and really tall looking walls (mountains) of trees. I felt at times like I could hardly bring myself to look at the tall walls for more than a couple of seconds..I'm telling you, if you haven't been to Montana, there are two Montanas. The wide open spaces and the Mountains. I digress, but I am also drinking wine. HA! and cooking dinner, and blogging, and watching Orange is the New Black so this recap could be not the best. I had to work the day before the run. BOO. Like we had mandatory let's count all the things in the building after a full day of work. Okay it wasn't that bad, but it's no one's favorite day. and you can't have the day off. It's a 6.5 hour drive to St Regis from my house. I got home at 7pm and everyone threw their bags in the car and we took off. My husband was tired from haying all week and I was hoping to sleep some so I wasn't exhausted for the run. We made pretty good time and got in to St Regis slightly before 2 am with only 1 stop for coffee and once to trade out driving. I caught the bus out to the start at 8 am and it was a quick 20 minute drive and we were waiting out in the cold! 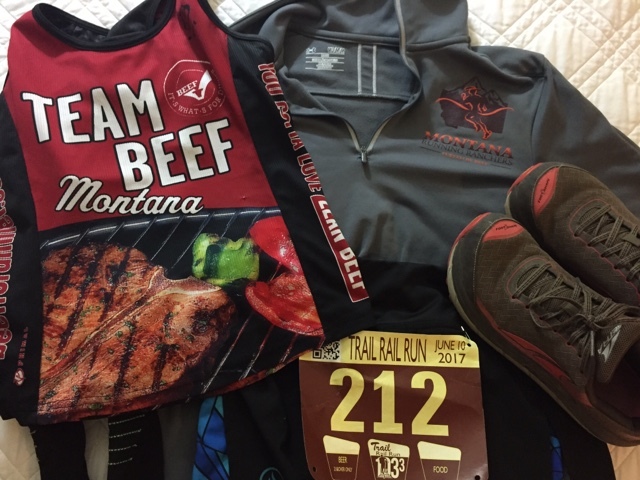 I picked up my bib since I missed it the night before and before I knew it the gun went off. The weather was a little cool but I knew once we started running it would feel AWESOME and I was right. I am standing in the red shirt and red head band in the picture below. I knew I should have taken off my long sleeve shirt, but I was so cold at the start! Right off I was the 4th person in the race... I kept waiting for some people to settle into their pace and pass me. Nope. I could see the three people up ahead of me for most of the race, which was nice. and motivating. I was about 2 miles in and I was regretting my decision to leave on my long sleeve shirt, I finally took it off about 4 miles in and tied it around my waist. I kept my pace right about 8 min per mile give or take a few seconds for the first 14 miles and the miles seem to fly by. We had to check in at all the aid stations, the first station we checked in at was off of the trail about a quarter of the mile and then back to the trail, but the rest were all along the trail. The aid stations all had water and some kind of rehydration drink. I had Tailwind in my bottles so I didn't look at what they had. 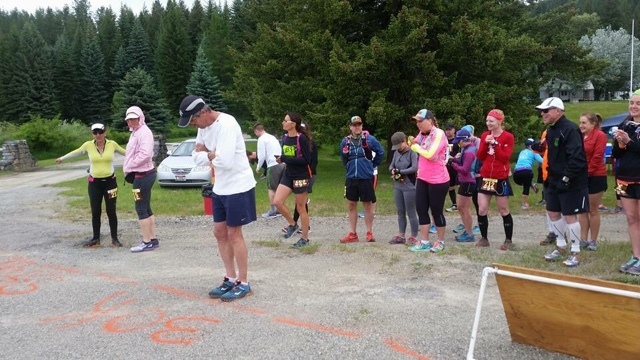 I am not sure what else they had at the aid stations, I know there were gels and some foods, but I left those for the people running the 50k and 50 mile and had some Honeystinger waffles and chews in my pack. I drank a cup of water at all the aid stations and made sure to drink some Tailwind every couple of miles. I felt really good until about 15 miles in and then I started feeling tired and I tripped! I landed hard on my left knee and was really worried the last 4 miles could really hurt, Both of my hands were throbbing and my right hand was bleeding a bit. Luckily my knee was okay and other than a bruise later was none the worse for the fall, My hands only throbbed for about a mile or so and the pain was a welcome distraction from how tired my legs were feeling! 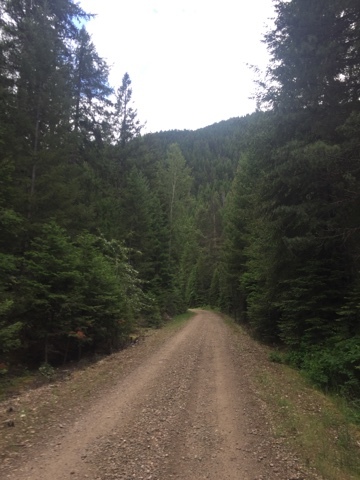 As you can see there was a lot of gravel on the trail/road we were on so the fall could have been a lot worse, some of the gravel was really rough and thick and there were potholes that were trying to trip me up more. 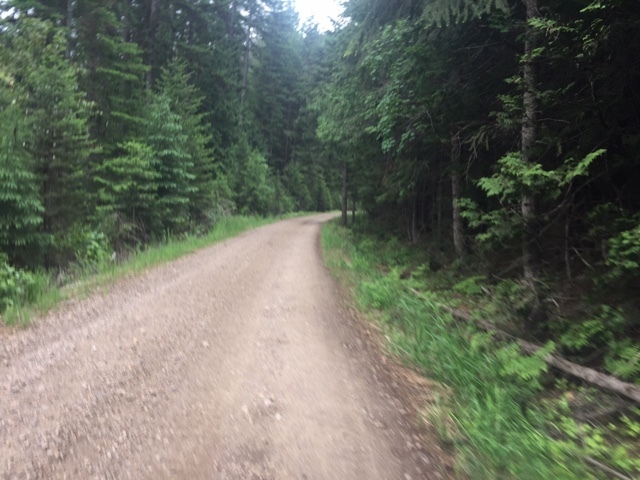 With about two miles to go we turned onto a paved road and I felt like my pace picked up a bit, and I was feeling motivated by the thought of being done soon. 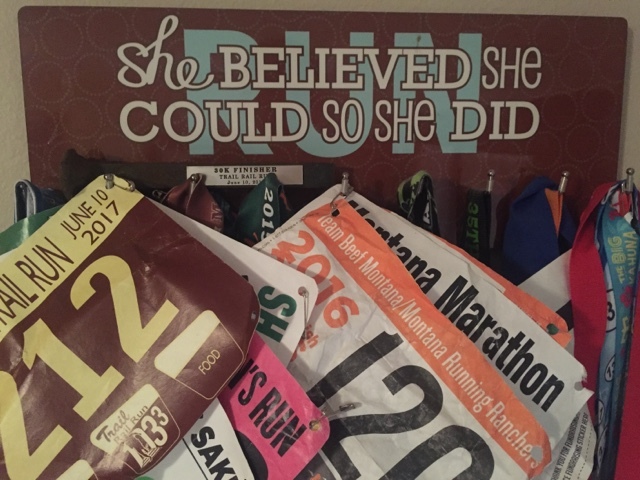 I also knew my family was going to be at the finish line. Other things that were motivating the last couple of miles... I started passing some of the 12k walkers and slower runners. So nice after miles and miles of just seeing one other girl and guy up ahead of me to have people to pass! I passed one other 30k runner with about 3 miles to go and that was motivating to try to stay ahead of him! Finally I could see the finish line and as I crossed it my kids ran up and hugged me and I nearly cried.. always so emotional! I received a railroad spike finisher prize and then went and got my swag bag which had my unisex tech tee and a water bottle in it. 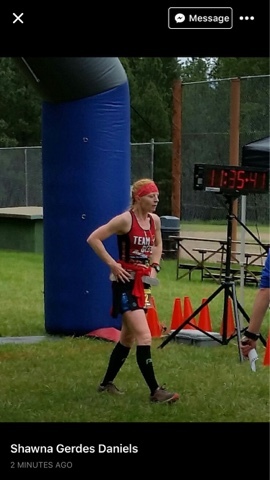 My sister in law got this shot just after I crossed the finish line. I was done! 8:00, and then..? I kept losing satelite connection and had weird ones like 11:07 and 5:37 kind of annoying, but my final time was 2:35:38 with average splits of 8:06 so I know I slowed down a bit the last couple miles but still held pretty consistent I think. Overall it was a great race and I would love to do it again. Congrats! I was wondering what you were up to! EXCELLENT!!!! Congratulations! Open spaces make me bonkers, I love all the closed in trails and trees and rock ledge, keeps it interesting and I can't see what is coming up next. The good thing about the fall is your hands kept you from thinking about your legs? Well Done!! Booo to falling, I have taken my share of spills and it isn't fun, I am glad it didn't slow you down. This is just a few hours from my Mom. It is always hard when you feel nippy to give up that extra layer, I did that exact same thing when I raced on the 24th. I knew it would warm up fast but that morning nip is something. The wide open spaces are sooooo amazing! Especially this time of year, I just kept stopping when I was driving to look at everything!! The plains are gorgeous. All the ridges and hills in the land are so interesting, but my camera couldn't begin to capture the beauty. 8:06 in the mountains for all them miles!!! FAST!!! If you lived in the mountains most of the races you ran would be over before they even started because you have speed, your all muscle and can jump out of the gym. Nice Job Christy!!! Good narrative style of the blogger. He keeps the content engaging by using colloquial and traditional English language. He should definitely GI for writing a novel. I really wish I were at your place and would be living in some mountainous area. I love to live near the sky where I can do planting and ranching. You are so lucky to be lived there in wordly heaven.